Richard Hunt is one of Canada’s most celebrated northwest coast artists. Born in 1951 in Alert Bay, British Columbia, he comes from a long line of internationally respected artists and carvers that have been instrumental in the survival of the Kwakwaka’wakw native art form. Richard Hunt began carving with his father, the late Henry Hunt, at the age of 13, and in 1973 began a carving apprenticeship under his guidance at the Royal BC Museum in Victoria. The next year, he assumed the duties of chief carver in the Thunderbird Park carving program—a position once held by his grandfather, master Kwakwaka’wakw carver Mungo Martin. Over the next 12 years, Richard established himself as a sort of “working exhibit,” demonstrating traditional methods of carving (no chainsaws allowed) and answering questions from the public about his culture. In 1986, he left Thunderbird Park to launch a career as a freelance aboriginal artist—a move that quickly placed him further into the spotlight. 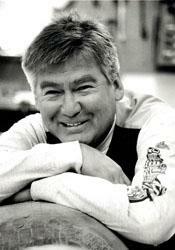 In 1991, Richard became the first native artist to receive the Order of British Columbia, and in 1994, he received the Order of Canada, the most prestigious award of his career. Richard Hunt’s career has spanned the globe, from carving a 30-foot totem pole for a private collector in Los Angeles, CA to lecturing at the Smithsonian Institution in New York. Back at home, he not only designed the bronze medal for the 1994 Commonwealth Games, held in Victoria, but also participated in the design and carving of the Queen’s Baton. Working alongside fellow native artists, Art Thompson (Nuu-chah-nulth) and Charles Elliott (Coast Salish), the hard-carved, sterling silver Baton brought together the three First Nations on Vancouver Island in a powerful display of tradition and unity. And in 2012, the Royal Canadian Mint used his Kwaguilth design, Two Loons, on their new $1 silver coin honouring the 25th anniversary of the loonie. It was the second of his designs to be produced by the Mint, the first being of a welcome figure in 2005. Richard Hunt’s native name, Gwe-la-yo-gwe-la-gya-lis, is highly appropriate considering his many accomplishments. It means “a man that travels and wherever he goes, he potlatchs.” Through his art, his speaking and his dancing, Mr. Hunt has indeed given much to the world.